Tekin’s TJ Bradley reports from RD4 of the FSEARA series! – Tekin – Smaller, Smarter, Faster! Tekin’s TJ Bradley reports from RD4 of the FSEARA series! Each year one of the most anticipated Florida State races is the Minnreg carpet on road race held in Clearwater Florida. This facility has deep roots in RC holding several ROAR nationals and the IFMAR World Championship in 2003. This year the Minnreg race had a record turnout with racers traveling from all over the southeast to battle for the win. Tekin team drivers Cory Parson and TJ Bradley were there competing in the very competitive 17.5 Touring class looking to bring home a “W” and build momentum heading into the Snowbird Nationals. When the first round got underway Cory Parson showed the fasted pace laying the only 35 lap run in the field with Austin Harrison qualifying second and TJ Bradley rounding out the top 3. After round one we had a re sort setting up the rocket round with everyone looking to improve and take a shot at Parsons TQ. After round 2 Cory was able to improve his time securing the top spot and Bradley improved his time moving up to second on the grid putting Tekin drivers one and two on the grid going into the main. Austin Harrison would lock in the three spot with Dave Bowser landing the four spot from the B qualifier and Joe Sumasky rounded out the top five. In the A-Main Cory left on the tone and pushed a little wide in the first corner allowing Bradley to overtake. TJ’s lead was short lived after a bobble put him back down to fourth and in a battle with Harrison, meanwhile Bowser made up two spots to second and Cory back to the lead. Cory was not going to give it up again and raced to the win with Bowser finishing in second and Bradley third. 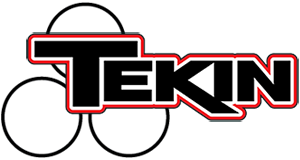 « Tekin takes RD3 of the JConcepts Top Notch Winter Series!